Scope of works: SAS system 330 metal ceiling with plasterboard margins and a perimeter blind box. 12 Hammersmith Grove was a relatively simple Cat B fit out of two office floors. As you can see from the photo of the project before the fit out, it was a nice new clean area. On these two floors, we were to install a plasterboard margin around the perimeter and core with a two-faced plasterboard bulkhead against the curtain wall that would form a box to house the window blinds. The main area was an SAS system 330 metal ceiling. The original ceiling specification for this project was for an Omega ceiling profile; this profile has a slot running down its centre. Unfortunately, they are not made in this country which makes them expensive and also gives them a longer procurement time. This was accepted by the client. 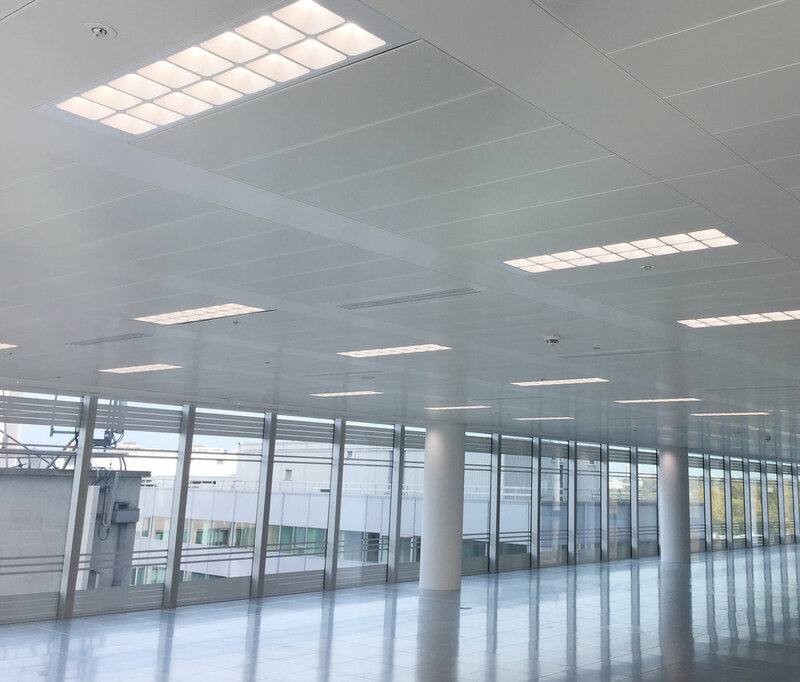 The most significant challenge we had to overcome on this project was that we were unable to install our works until the mechanical and electrical contractors had completed their first fix works – unfortunately, they were behind programme. The project duration was eleven weeks, and we were forced to install 75% of our work in the last three weeks. We increased our labour levels accordingly and worked overtime and weekends and still managed to deliver the project on time.